I decided to bake cupcakes tonight. After watching several episodes of DC Cupcakes on Netflix, I was craving dessert! I wanted to do something different though. They had all of these wonderful flavors on the show, of course I was not going to be satisfied with a plain jane vanilla cupcake! Initially, I was planning to substitute the oil with strawberry puree...but then I added oil on accident. Argh! So, I ended up substituting half of the water with strawberry puree. The recipe turned out fine, they were moist and flavorful. They did not, however, taste like strawberries ... just vanilla. I did have to take about 4 minutes off of the suggested baking time. So, the cupcakes tasted good even though they ended up being just vanilla. Next, I pulled out my favorite cream cheese frosting recipe! You can find it here, at Glorious Treats. 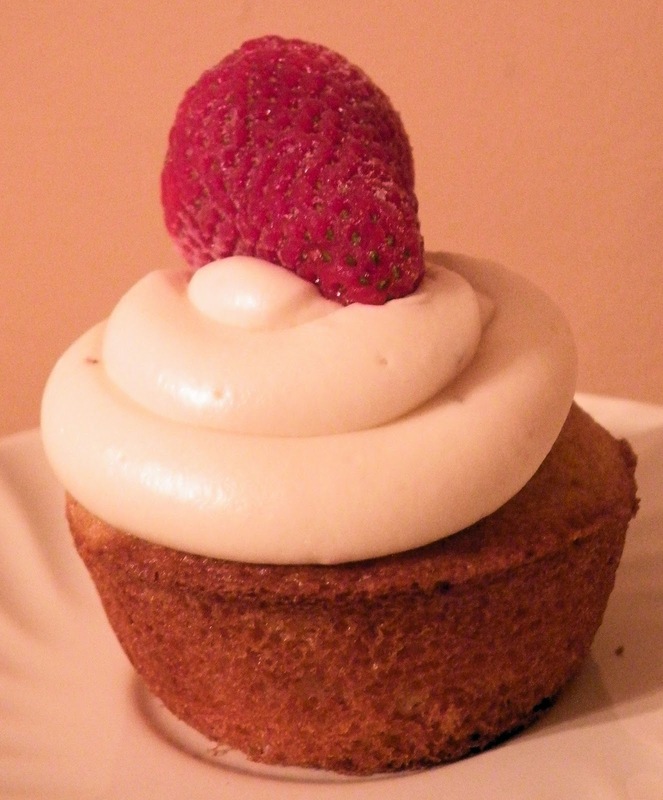 I wanted to make the strawberry flavored frosting, but only had about a teaspoon of puree left. So, I halved the recipe and added the little bit of puree. It had just a hint of sweet, strawberry flavor. Not too bad. I am going to try this again. Next time, though, I will substitute the strawberries for the oil and add more strawberries to the frosting! I guess if I had enough puree to substitute all of the water, the flavor might have been stronger. My plan was to cut out some of the fat though, so substituting for the water doesn't help with that!